If you’re a developer working for one of our many clients or partners, you have the ability to integrate one of our solutions with your existing point-of-sale (POS) software and terminals. The information below will help you understand the features and benefits of our payment platform from a technical perspective to help you make informed decisions on which solutions work best for you. With DishOut, you’ll never need another payment platform again. Our platform allows you to process payments securely with encryption and tokenization, provides diverse connectivity with multiple access points, and provides unrestricted growth potential of the payment gateway with no change to the underlying architecture. Our payment platform is simple for developers, end-users, and even your customers. Variety of APIs for easy integration. PCI & EMV compliant tools. Two-way communication between POS and mobile devices. Built-in stored value solutions with gift, loyalty, and rebate programs which can be either card or mobile based. Real-time reporting tools and 24/7 in-house technical support. Customizable and brandable solutions will feel uniquely yours. 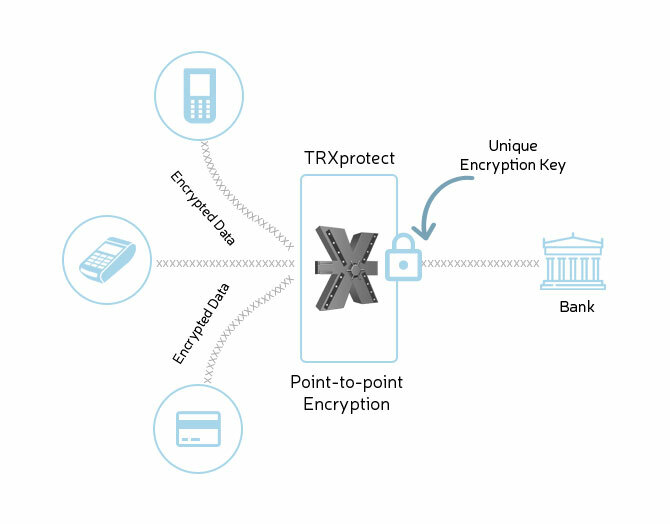 TRXprotect is DishOut’s open platform encryption solution designed to offer the most cost effective and efficient secure service for protecting card holder data from the point of capture “end-to-end” through storage and token management. TRXprotect allows encryption and decryption to take place during the normal routing of transactions. Support for multiple technologies and peripherals. TRXprotect is a PCI, EMV, and PADSS compliant application to add protection to your POS. TRXprotect can be integrated with simple APIs, can be used as a stand-alone UI on Windows devices, and handles all device communication. After selecting their products or receiving their service from your business, a customer initiates a payment. Your POS system initiates a transaction, and the POS calls TRXprotect. In the case of EMV, the Bluetooth device is initialized and the transactional information is received. Otherwise, the transactional information is passed to the TRXvault Gateway. Once the gateway receives the information, it processes the transaction and sends it to the bank where it is securely processed and the result returned to TRXprotect. TRXprotect then passes the result of the transaction, whether approved or denied, back to the POS where the customer’s transaction is complete, or another form of payment is needed. 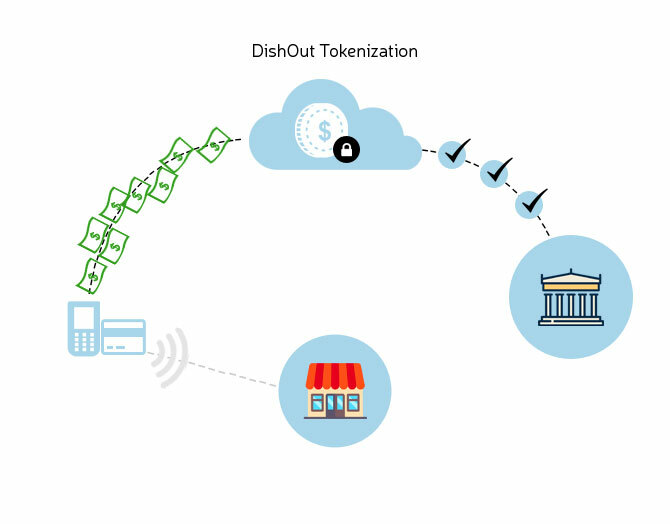 DishOut’s multi-use tokenization product allows a merchant to keep a card on file for repeat billing, without the card needing to be re-entered. Multi-use tokenization tokenizes the card number. The token can be retained on file until the original card expires. Token can be used to create customer portfolios for use across merchants with multiple locations. Token can be used with QSR codes or password/login applications. 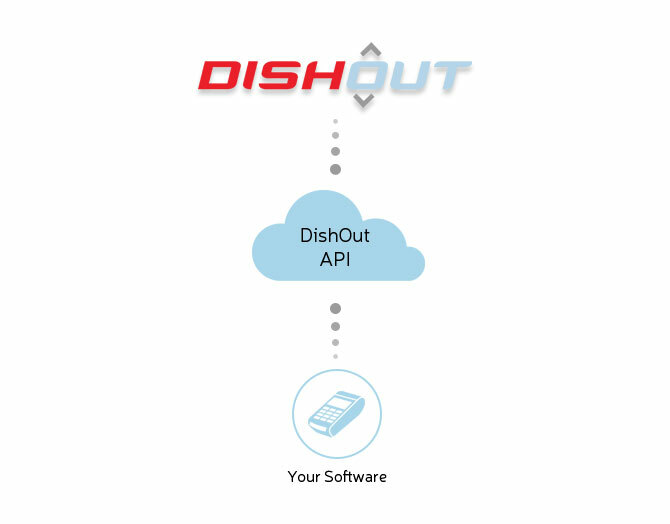 Slingshot is middleware with a series of web services that sits between third-party applications (web-based, mobile web-based, or native mobile apps) and DishOut’s Native Mobile Payment Application. Only minimal code is required for the TRX Mobile Payment App to use Slingshot. Simply implement our web services to interact on both sides of Slingshot. Slingshot allows third-party applications to send details about a particular order (via a web service, which you will develop), so that those details can be sent to our cloud server and later accessed for a variety of purposes. The details uploaded to the cloud server are then sent to your mobile application so that payment can be processed.